KINGSTON, Jamaica, Dec 4 2015 (IPS) - Residents of Rocky Point, a sleepy fishing village on Jamaica’s south coast, woke up one July morning this year to flooded streets and yards. The sea had washed some 200 metres inland, flooding drains and leaving knee-deep water on the streets and inside people’s home, a result of high tides and windy conditions. “I’ve been here for 43 years and I have never seen it like this,” Sydney Thomas told the Jamaica Observer newspaper. 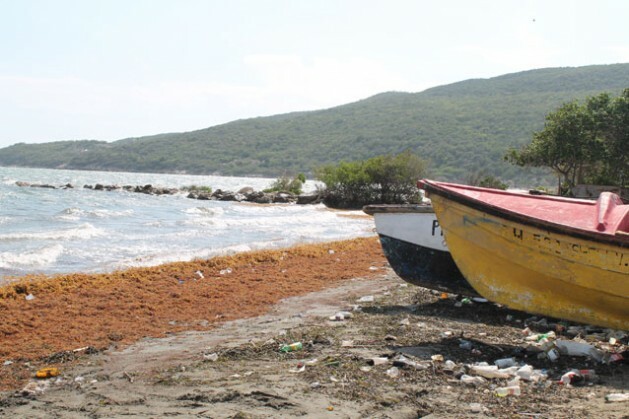 Over at the Hellshire Fishing Beach, a community several miles outside the capital city Kingston, fishermen watched as their beach disappeared over a matter of weeks. The sea now lapped at the sides of buildings. Boats that once sat on the sand were bobbing in the surf along the edge of what remained of the white sand beach. An the far end of the Hunts Bay basin, the inner-city community of Seaview Gardens sat at the edge of the mangrove swamp. For decades, residents there lived with overflowing sewage systems, the result of a backflow that is caused when seawater enters outflow pipes, flooding the network and pushing waste water back into homes and into the streets. Flooding in coastal communities around Jamaica is nothing new but in recent years, what used to be unusual has become a frequent occurrence. Coastal Zone Management Specialist Peter Wilson-Kelly has seen several areas of the island where the stories are the same. “It’s a combination of incremental climate change factors like sea level rise, hurricane damage from which new shoreline position baselines have evolved and man-made influences, such as hard structures too close to the shore,” he said. In 2004, six people died when a storm surge pushed by Hurricane Ivan inundated Portland Cottage. And in East Kingston, several multi-million dollar homes along Caribbean Terrace, a residential community overlooking the sea, were destroyed when the hurricane pushed the sea inland. High waves also destroyed the sand dunes, which prior to that time, had served as a natural fortification for the Palisadoes Road, which connects the historic town of Port Royal and the Norman Manley International Airport to the rest of the country. The Caribbean has contributed very little to global climate change, but UN experts warn that small island nations like these are expected to bear the brunt of the damage. In Jamaica, the destruction of wetlands to make way for development projects and overfishing have reduced the effectiveness of the reefs, exposing the coastline to unchecked wave actions and undermined the effectiveness of the wetlands to limit the impact of high tides. Wilson-Kelly also blames unchecked development for the problems at the Hellshire beach. “The reef’s been damaged for some time and hurricanes Ivan, Dean, Sandy and a bunch of other systems have passed and influenced the shoreline. However, the numbers of facilities that have established themselves on the Hellshire beach have also increased,” he said. It is the reason Caribbean countries like Jamaica are lobbying for a 1.5 degree Celsius cap on temperature rise above preindustrial levels at the 21st Conference of the Parties (COP21) to the United Nations Framework Convention on Climate Change (UNFCCC) in France, in December. The Caribbean is reported to have lost 136 billion dollars due to damage from climate change between 1990 and 2008, due to climate related damage. In its 2010 Modeling report, the UNDP warned that without adaptation and mitigation, the Caribbean could lose five per cent of its GDP or 10.7 billion dollars by 2025. By 2050, that figure could more than double, rising to roughly 22 billion dollars by 2050 or about 10 per cent of GDP. In 2011, Jamaica’s second communication to the UNFCCC projected that the cost of protecting tourist resorts in the most vulnerable areas could cost between 92.3 million dollars and 993.8 million dollars. Some reports are, that by 2080, the 15 CARICOM member states could face a staggering 187 billion dollars in repairs and rebuilding costs for some of their best tourist resorts. The outlook is ominous, given Jamaica’s history of destructive storm surges and major incidents of floods in recent decades and resulting in damage to infrastructure and loss of life. Besides the unsanitary effects of flooded sewers, the value of social and economic assets exposed to the hazards associated with coastal flooding has been estimated at 18.6 billion dollars. Economist Maurice Mason noted, “Everything up to 10 meters of Jamaica’s coast, all of the island’s critical facilities, including power generation facilities, trans-shipment ports, both major airports and resort towns” representing about 70 per cent of the country’s GDP are at risk. Elevating four kilometers of the Palisadoes road just over three metres in 2010 cost Jamaica some 65 million dollars. Several mitigation projects later, Rocky Point continues to suffer coastal flooding. In Portland Cottage, residents replanted denuded mangroves to strengthen their natural coastal fortifications that they credited with minimising the loss of lives in 2004. Along the famous Negril beach, government and residents still haggle over the most effective way to protect the coast because none, neither government nor private sector, can afford the full cost of protection and the international community has provided only a fraction of the estimated 25 million dollars needed. Under Jamaica’s Vision 2030 Plan, many adaptation measures will, over time, mitigate some of the effects. Several communities have and do benefit, but only education, continued preparation and global action can manage the effects.